It was late 2001 when I finally came full circle and returned to the arts, my first choice when I left school in 1977. 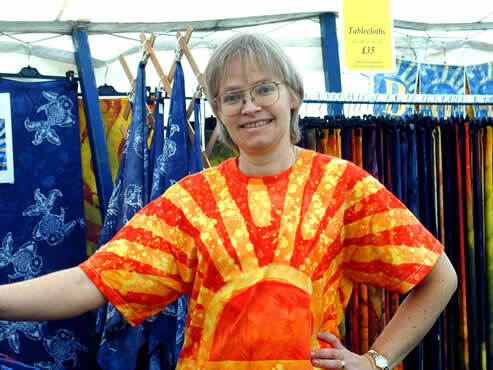 I realised a long time dream – a business in fabric dyeing. It brought all the things together that are most important to me – the love of textiles and colour, of arts and cultures. My inspiration came from my travels in countries rich in folklore and traditions, and from my walks in the Chiltern Hills, from the colours of the changing seasons, and from classical and traditional music – particularly from the music and ideals of Joan Baez. I set out to bring the glorious feeling of the great outdoors inside people’s homes, to share my feeling of happiness when I’m out and about, and to translate the music I love into colours. Welcome to the sunshine in your house and heart!